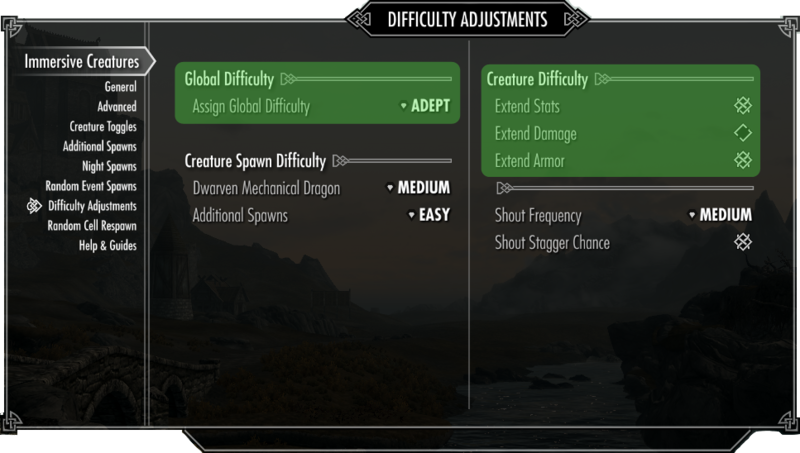 This mod adds new enemies starting at level 10 for almost all of Skyrim's enemy types. The stats, skills, perks, spells, damage dealt and damage mitigated of each variant were adjusted to keep enemies in line with the player's natural progression so that the game continues to provide a challenge at higher levels. To give an example of what's been added, in Vanilla the highest level bandit was level 25 (28 for a boss). This mod adds bandits at levels 30, 40, 50 and 60 (66 for a boss). However, once you pass lvl 60 the game won't suddenly get easy. The top level enemies of each type will scale with your level. This means you'll still get the same variety of enemies you expect from Skyrim but you'll never outlevel everything ensuring the game remains challenging. So for example at level 70 you'll encounter the usual bandits from Skyrim as well as the added level 30, 40 and 50 bandits, but the highest level bandit (originally level 60) will scale to match you at level 70. HLE - Skyrim Immersive Creatures Edition replaces the the original version for user of my mod. It offers streamlined compatibility and consistent experience. Read further for explicit details. changed skeever naming convention and renamed "Skeever King"
The new HLE - SIC Edition is compatible with all optional plugins from the original "High Level Enemies" mod by Dalquist. You don't need the original mod in order to run HLE - SIC Edition. Info: Bash Tags are embedded into the ESPs. No Need to set them manually. The HLE - SIC Edition is now available from the main SIC Page on the Nexus here.